Training your legs with dumbbells works all of your lower-body muscles together rather than one muscle group individually. This method can help you burn more calories in less time and increase full-body strength together while you work on balance, core stability, coordination and breathing. Physical therapist Gray Cook recommends the squat, lunge and step-up because these movement patterns are the foundations to most skills in daily activities and sports, such as climbing stairs and track and field events. With some space at home or at the gym, you can get a full-body workout without having to hop from machine-to-machine. To do a basic dumbbell squat, hold a dumbbell in each hand by your sides, and stand with your feet about shoulder-distance apart. Inhale as you squat down as low as you can without hunching your back or shoulders. Exhale as you push your feet against the floor to stand straight up. For the step-up, use a sturdy bench or a similar platform and stand in front of it with a dumbbell in each hand. Step on top of the bench with one foot, and push yourself on top of the step, raising your opposite knee to your chest when you're on top of the step. To do the lunge, stand with your feet together and hold a dumbbell in each hand by your side. Inhale as you step forward and lunge down until your back knee almost touches the floor. Exhale as you push yourself back up to the standing position. For beginners, start with the squat, lunge and step-up exercises without dumbbells. Once you can perform these exercises well with your body weight, add dumbbells to these exercises. Increase the intensity of your leg workout with supersets to help you save more time while improving muscular endurance and recovery. This involves performing two sets of exercise that work on different body parts without rest in between, allowing one muscle to work while the other group rests. For example, do one set of dumbbell squats followed by an upper-body exercise, such as pushups or pull-ups. Rest for one minute before repeating the superset two more times. The volume of work and the exercise intensity and speed that you perform depends on your goals. The National Academy of Sports Medicine recommends that you perform three to four sets of eight to 12 reps at 70 to 85 percent of your maximum effort if you want to maximize muscle growth. If you want to work on endurance, perform one to three sets of 12 to 25 reps at 50 to 70 percent of your maximum effort. You can increase or decrease the intensity by changing the weight of the dumbbells, the duration of your rest period and using one, two or no dumbbells. Squats, lunges and step-ups can be performed in more than one plane of motion. For example, you lunge to the side, to the back and diagonally from your starting position. Add a torso twist to your left or right as you lunge down or stand straight up from a squat or step-up. You can also add a shoulder press to these exercises to work on your shoulders and arms. To do a squat press, hold a dumbbell in each hand over your shoulders with your elbows close to your ribs, and inhale as you squat down as low as you can. 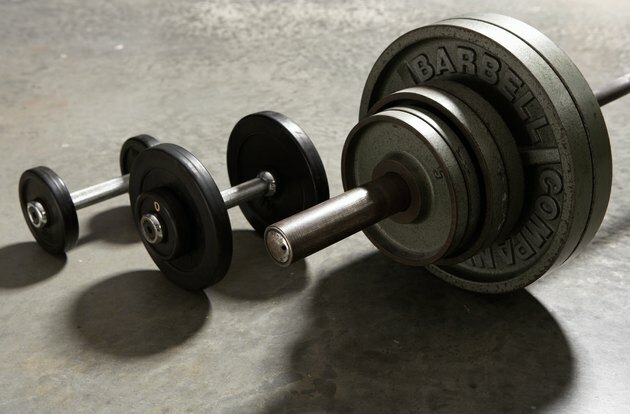 Exhale as you stand straight up and press the weights over your head. This can be applied to the lunge and step-up.